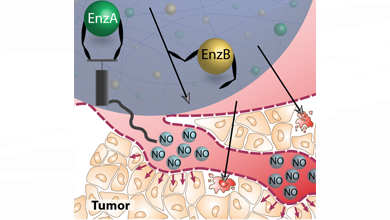 Our work “Bi‐Enzymatic Embolization Beads for Two‐Armed Enzyme‐Prodrug Therapy” has been recently published in Advanced Therapeutics. Embolic beads, a successful tool for localized, site‐specific drug delivery, are engineered herein to contain the toolbox of enzyme‐prodrug therapy (EPT). EPT offers facile means to synthesize diverse drugs at their nominated concentrations; individually, in sequence, or in a combination. The authors investigate alginate beads as embolic bodies and screen alginate type and bead production parameters as factors to control activity of the immobilized enzymes. Engineered embolic bodies are armed with bi‐enzymatic EPT such that two enzymes perform biosynthesis of drugs with an independent control over each enzyme. Enzymatic synthesis of nitric oxide (NO) performed by embolic bodies is accomplished herein for the first time and is fine‐tuned such that flux of NO afforded by the beads matches that of healthy human endothelium. Ensuing vasodilation is illustrated ex vivo using rat mesenteric arteries. Independently, the production of SN‐38 is used to control the antiproliferative effects elicited by the beads. Bi‐enzymatic EPT engineered into embolic bodies thus affords opportunities for combination therapy and personalized treatment (adjusted combinations and concentrations of drugs) that go well beyond the state‐of‐the‐art of current embolic bodies and hold much promise for biomedical applications, specifically the treatment of hepatocellular carcinoma.